I am a freelance research lawyer practising in Vancouver, BC. I write about freelancing, working from home, and - you guessed it - legal research and writing. Nothing here is legal advice. Welcome to my blog! 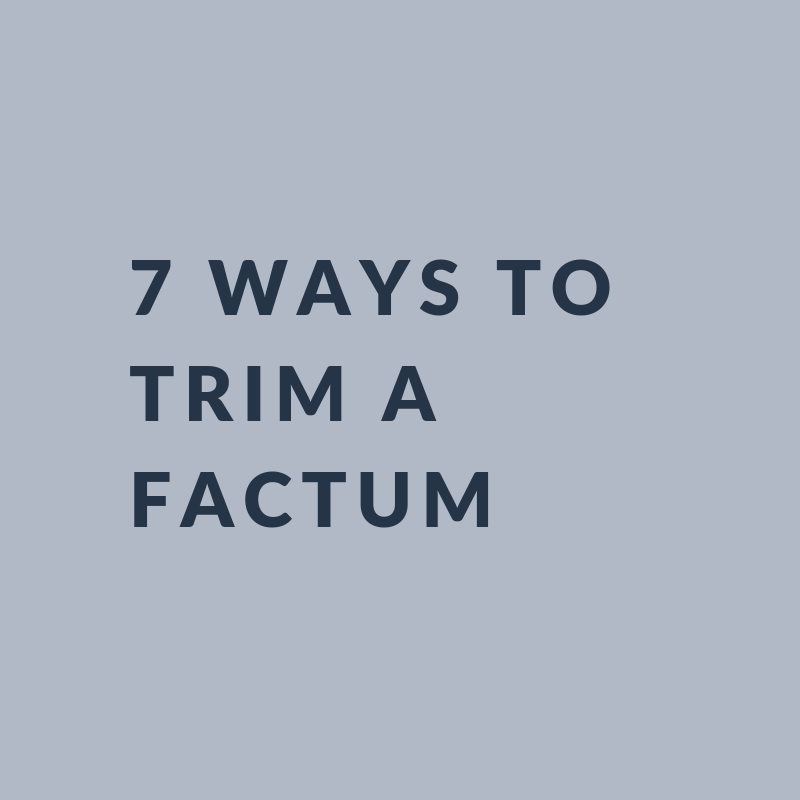 *This post isn’t just about factums. It’s also about notices of application, application responses and other types of written submissions. I just can’t think of a single term to describe all of these documents. Many of you have been there before. Most appellate courts set page limits on factums. Even apart from the rules, most of us would like to find ways to express ourselves in fewer pages. Check out these 7 tips for drafting a shorter legal argument. One of my favourite space-saving tips is to take information out of the main paragraph and move it down into the citations. (Of course, this only works for footnotes or under-paragraph citations, not in-text citations). This technique works well when you want to add a detail or two about a few cases, but don’t want to clutter up your submissions. In several recent cases, this Court has allowed parties to amend pleadings during or at the end of trial. For example, in Alfa v. Bravo, in the context of a defamation claim, the Court granted an order permitting the plaintiff to amend his pleading to claim punitive damages following the conclusion of the evidence. In Delta v. Echo, a conspiracy action, the Court allowed the defendant to amend its pleading to add a champerty defence at the end of trial. And, in Golf v. Hotel, a negligence claim, the Court permitted the plaintiff to amend her claim to clarify a failure to warn allegation part-way through the trial. In several recent cases, this Court has allowed parties to amend pleadings during or at the end of trial. By moving the information down into the citations, I’ve saved several lines of text and put more emphasis on my main point. Typically, in written argument, lawyers begin by setting out the applicable legal test, with a citation to the leading authority for that test. Then, we set out the reasons why our client meets (or the other side doesn’t meet) each element of the test. For the most part, it’s a good practice. But if you need to save space, try compressing the two. Defendant did not deliberately fail to defend - The notice of civil claim was served on the defendant’s registered and records office (the defendant’s accountant) on November 1, 2016. However, that day the accountant was moving offices and failed to forward the claim to the defendant. The defendant’s principal learned of the action on January 25, 2017, the date the default judgment was served. Defendant applied to set aside default as soon as reasonably possible - Two days after service of the default judgment, on January 27, 2017, the defendant retained counsel. One week later, its counsel served this application. Defendant has a meritorious defence - The alleged oral agreement on which the plaintiff relies was never formed. Though the parties engaged in negotiations for several weeks, there was no meeting of the minds. In two e-mails written in July and August 2015, the plaintiff’s president confirmed that the agreement was off. This technique won’t always be appropriate. Often, you’ll want to take more space to address each part of a legal test. I find this technique works well when I’m drafting an interlocutory application on several procedural points, and I only have limited space to address each one. 3. Ask yourself, do I really need that whole block quote? We lawyers love a good block quote. I mean, why waste time trying to improve upon what a judge has already said? We’ll often include the whole paragraph from the case, adding emphasis for the particularly relevant parts. But as much as we love including block quotes, most lawyers and judges hate reading them. In fact, research has shown that the eye naturally travels over them to the next paragraph. Plus, they can unduly lengthen a document. Try this instead: take only the truly relevant part of the quote and integrate it into the body of your paragraph. Make sure it’s no longer than two lines. (And if you absolutely must use a block quote, set it up with a nice introduction that connects it to your argument, and only include the bits that you actually need). I know how it feels. You’ve done a lot of research. You’ve found a lot of good cases. You want to showcase all of that brilliant hard work. But do you really need to cite every one of those cases? Probably not. For example, if you’re discussing a well-established principle, you probably just need the leading appellate authority, perhaps accompanied by a trial-level decision that applied the leading authority to a similar set of facts. Too many cases will clutter up your document, give the judge the impression that you’re not confident on the legal point, and waste everyone’s time by requiring them to review five cases instead of one or two. As I’ve written on here before, I’m a big fan of headings. Please don’t sacrifice your headings in the name of saving space. You need them. The judge needs them. They are essential to a well-written and easy-to-digest document. Since you’re already using up space with headings, make sure they’re as descriptive as reasonably possible. That can save you a sentence or two in the body of the argument. That way, you can get right into why you meet the test underneath the heading. Most people will tell you that the facts are the most important part of any legal argument. I agree. But that doesn’t mean you need to include allllllll the facts. Often, when we’re drafting a legal document, we’ll pull up a version of the facts that we’ve already prepared for a pleading, a mediation brief, or opinion letter, and cut and paste it into our argument. Then we edit it a bit to make sure all the relevant facts are there and leave it at that. This can result in a facts section that’s much too long. Don’t try to cut down the length while you’re also trying to perfect your analysis or search out typos. It’s inefficient and you’ll get distracted. Instead, leave yourself time at the end to edit only for length. Write in the active rather than passive voice; that will usually result in shorter sentences. Avoid adverbs to the extent possible - they’re usually unnecessary. Don’t be verbose when simpler language will do. Eugene Meehan provides a helpful list of what he calls “verbose/fancy-dancy intros/fillers” in this paper (the list is at page 4 but I recommend reading the whole thing).